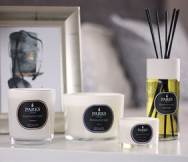 Parks room sprays fill your home with a beautiful, long-lasting scent – the natural way. We use only the highest quality essential oils blended into exquisite combinations to create our sought-after sprays which offer beautiful lingering scents without the use of chemicals. Ever since our founder Carol Symons opened her first shop almost three decades ago, the Parks philosophy has been to create natural, eco-friendly chemical-free products. Our room sprays are free from unwanted ingredients, offering a pure and natural way to fill your home with our stunning aromas. The essential oils we use have been shown to benefit both body and mind - aiding relaxation, reducing stress, melting away anxieties and helping you to get a better night’s sleep. Each of our sprays has an alluring, addictive scent, giving your home its own unique personality. Our room sprays help to banish unwanted smells and give every room in your home an aroma that is bright, fresh and uplifting.